This is a 2018 Berkshire, 23” Berkshire Tri-Toon with Mercury 150HP Four Stroke Motor. This Tri-Toon has Pearl White/Navy Blue exterior. 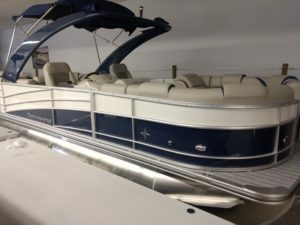 Upgrades are numerous including 3.0 performance package, this is truly a must see boat!